Posted on April 11, 2014 Categories Bibulo.us, Food and Drink, friends & familyLeave a comment on Sherry Cobblers! 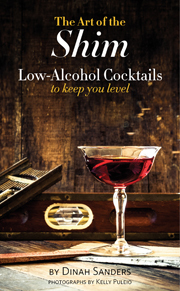 I gave a presentation on The Art of the Shim: Low-Alcohol Cocktails to Keep You Level in the afternoon at Coast Library. Alas, due to a complaint from a modern-day Puritan we could not give samples of even the lowest proof of cocktails, so the attendees just got to taste Luxardo cherries. Despite the sample setback, the event was a success and the small crowd enthusiastic. There were great questions, including one on the history of an obscure drink or possibly dessert or possibly both, the Knickerbocker Glory, which I'm researching in the picture below. It was very windy but lovely on the way back to my folks' house. That evening I was able to provide a private sample to thank my parents for their help with the event. This is an interlude of relaxation after the stockings, before our drive back home.